Recently completed in Dana Point, the design of this modern cottage incorporates natural finishes, geometric forms and custom details reflective of the home's contemporary aesthetic and unique local character. At the interior, thoughtful material selection and application play a key role in creating spaces that are both unexpected and familiar, such as this secondary bathroom that features a playful combination of color, contrast and texture. Heath ceramic tile in KPFA green, installed full-height in a vertical running bond pattern, enhances the sense of volume created by the existing sloping ceiling and exposed wood structure. Bright white stacked tile at the adjacent wall provides for visual balance, and a minimal wall-mounted trough sink and flush mirror keep the focus on the texture created by the pattern of the handmade tile. At the floor plane, custom concrete terrazzo ties the surfaces together, while providing for both durability and textural movement underfoot. From Concrete Collaborative, the material beautifully complements the depth of color at the wall, with natural stone aggregates in ivory and verde. 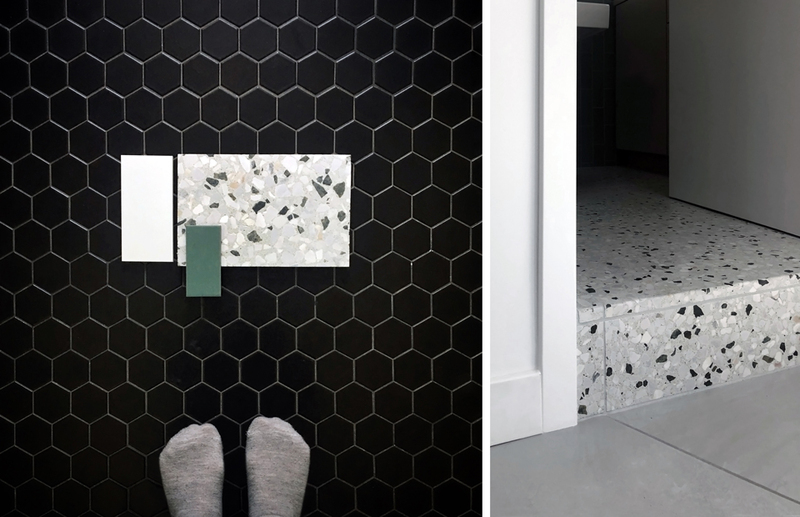 A more contemporary approach to the traditional application, the larger aggregate highlights the organic variation inherent in the natural materials, and the unexpected scale adds interest while still creating the consistency and seamless appearance for which terrazzo is so well known. We look forward to sharing more photos of this modern beach cottage in nearby Lantern Village soon- in the meanwhile, revisit previous posts to follow the project progress through design to construction.